Jamie Ward's goal helped Derby edge a hard-fought game at Bournemouth. After a lively but cagey first half, Ward broke the deadlock on the hour when he powered home Craig Forsyth's left-wing cross from close range. Until then, Bournemouth's ex-Rams keeper Lee Camp had kept his old side at bay, saving from Ward, Chris Martin and on-loan Simon Dawkins. Tokelo Rantie went close for the Cherries, while substitute Matt Ritchie nearly conjured a late equaliser. The ex-Swindon winger, League One's player of the year last season, was making his first appearance of 2013-14 after a thigh injury. Ritchie was nearly able to save the day for Eddie Howe's side, whipping in a cross which fellow substitute Ryan Fraser headed wide, and threatening Lee Grant's goal twice himself. But as the Cherries pressed for a leveller, Camp was called upon twice more to deny Derby substitute Mason Bennett when the visitors threatened a second on the break. Derby, who moved to within a point of the play-offs, had the better of the early exchanges, with reported Liverpool target Will Hughes setting up Ward, but Camp smothered his shot before tipping over Martin's volley. Bournemouth gradually improved as South Africa striker Rantie surged forward and fired in a fierce shot from an acute angle which Grant had to block at his near post. Camp proved equal to efforts from Ward and Dawkins, while the loud contingent of 1,391 away fans had a heart-stopping moment when Brett Pitman's swirling cross slipped out of the unchallenged Grant's gloves like a bar of soap, and Derby defender Jake Buxton was cautioned for scything down the lively Rantie as the first period drew to a close. On loan from West Brom, Camp turned provider when he threw the ball out to Lewis Grabban, who scampered down the right and crossed but Pitman volleyed wide, while Marc Pugh's control let him down from another Grabban cross. But after trying his luck with a 30-yard free-kick, Ward's fierce shot opened the scoring as Camp's goal was finally breached. Bournemouth, playing in front of their highest home crowd of the season, introduced Ritchie and Fraser and that nearly paid dividends as Ritchie had a shot deflected for a corner and blasted another effort wide from the resulting flag-kick, while the other two Cherries replacements combined as Fraser headed Wes Thomas's cross wide. But Steve McClaren's side were able to see out the victory, while Bournemouth finished with 10 men after defender Steve Cook was carried off on a stretcher in stoppage time. "I thought Derby were good and the best team we have played this season. "We don't like losing games as it is certainly something we are not used to. "I said at the start of the year that any expectation other than survival is way out of what it should be." "It is hard to say if we are play-off material. I said before the match we just go week to week and enjoy what we are doing. "We could have had more goals but in the end our defenders and goalkeeper were great in helping us hold on when they threw the kitchen sink at us. "It was an unbelievable team goal and it was just reward from what was a gritty performance and one that keeps our momentum going." Match ends, Bournemouth 0, Derby County 1. Second Half ends, Bournemouth 0, Derby County 1. Steve Cook went off injured after Bournemouth had used all subs. Attempt saved. Steve Cook (Bournemouth) left footed shot from the centre of the box is saved in the bottom left corner. Assisted by Matt Ritchie with a headed pass. Offside, Derby County. Jake Buxton tries a through ball, but Conor Sammon is caught offside. Offside, Derby County. Johnny Russell tries a through ball, but Chris Martin is caught offside. Attempt saved. Mason Bennett (Derby County) header from the centre of the box is saved in the centre of the goal. Assisted by Johnny Russell. Offside, Derby County. Chris Martin tries a through ball, but Mason Bennett is caught offside. Attempt saved. Mason Bennett (Derby County) left footed shot from the left side of the box is saved in the bottom left corner. Assisted by Johnny Russell. Corner, Bournemouth. Conceded by Andre Wisdom. Attempt blocked. Ryan Fraser (Bournemouth) right footed shot from the left side of the box is blocked. Assisted by Matt Ritchie. Attempt missed. Ryan Fraser (Bournemouth) header from the centre of the box is close, but misses to the left. Assisted by Wes Thomas with a cross. Attempt missed. Matt Ritchie (Bournemouth) left footed shot from outside the box is too high following a corner. Substitution, Derby County. Johnny Russell replaces Jamie Ward because of an injury. Corner, Derby County. Conceded by Simon Francis. Substitution, Derby County. Mason Bennett replaces Simon Dawkins. Substitution, Bournemouth. Wes Thomas replaces Brett Pitman. Attempt missed. Eunan O'Kane (Bournemouth) header from the centre of the box is high and wide to the right. Assisted by Matt Ritchie with a cross. 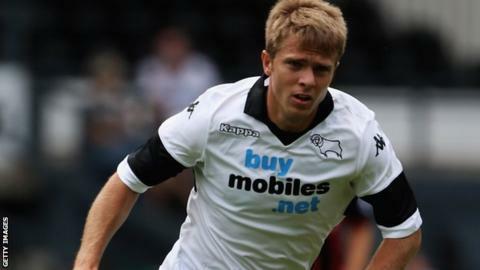 Delay in match Jamie Ward (Derby County) because of an injury. Attempt saved. Jamie Ward (Derby County) left footed shot from outside the box is saved in the centre of the goal. Assisted by Chris Martin. Attempt missed. Brett Pitman (Bournemouth) left footed shot from the centre of the box is high and wide to the right. Assisted by Ryan Fraser with a cross. Substitution, Bournemouth. Matt Ritchie replaces Tokelo Rantie. Attempt missed. Will Hughes (Derby County) left footed shot from the centre of the box is close, but misses the top left corner. Assisted by Chris Martin following a corner.